Today I am still glowing in the aftermath of a positive visit to the hospital yesterday, plus a positive response from my publisher and most of all the presence of my tall, thoughtful son. Today’s events so far have a sort of Navajo theme about them. One of the fun things about my necessary nail care is choosing a new colour, especially this week when things have tended to be a bit gloomy. My fingers have changed shape since I’ve been ill, so I can wear my Navajo ring again which has been in the box for about 10 years. It was a gift from my parents-in-law the first time I visited them on my own in Phoenix. We drove up to Fort Apache and Montezuma’s Castle a cliff dwelling on the reservation and they bought me the ring as a memento of that trip. The silver and turquoise are traditional Navajo with rays carved to represent the sun, and small half moons curved with rain drops. Later when we moved to Chicago I met “Laura” (her Facebook name) and discovered someone else who was as passionate about Navajo arts & crafts as I was. 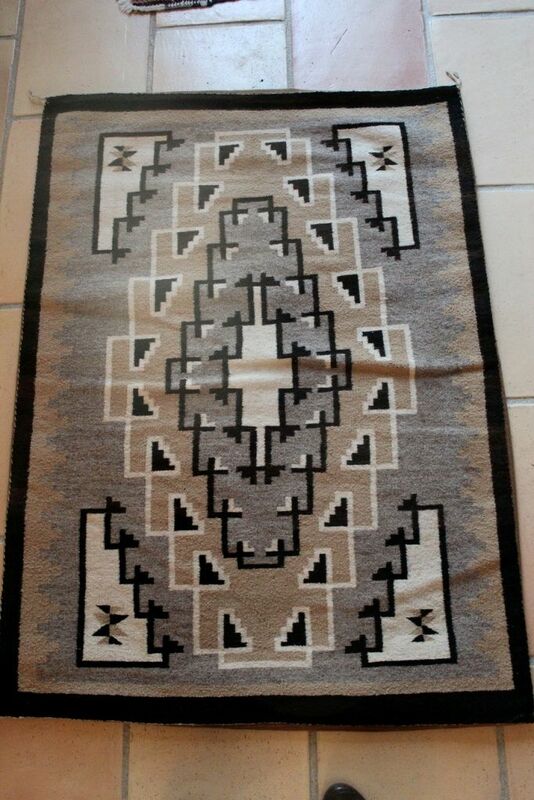 In her travels west she collected Navajo rugs in traditional designs like the one pictured here called Two Gray Hills, which she has very kindly allowed me to reproduce in my Practical Weaving book. 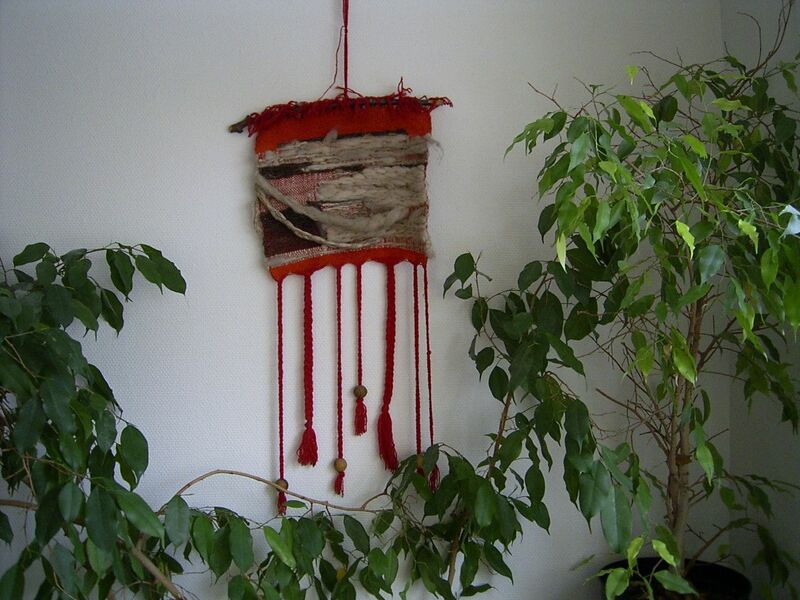 “Laura”‘s enthusiasm for Navajo weaving coincided with my own growing awareness of the the craft and contributed to my determination to become a weaver. In the years that followed we met a few times, but then lost touch. She had meanwhile moved to the South of France and carried on her own fabulous textile work there. She discovered me a few years ago on the Ravelry website for knitters, got in touch and the rest is the next phase of history. You can read about her rediscovery of me on her blog Miracle Design and find out more about her gorgeous textiles as well.Update on the Arran weather situation – please send thoughts and prayers to those that haven’t yet got power switched on again. We have been asked to be careful about our electricity use as we are still on emergency generators. It’s so easy to forget the deprivation once everything comes on again. The emergency crews have been wonderful, working hard to get pylons up and running again and getting food through to people who are stranded. 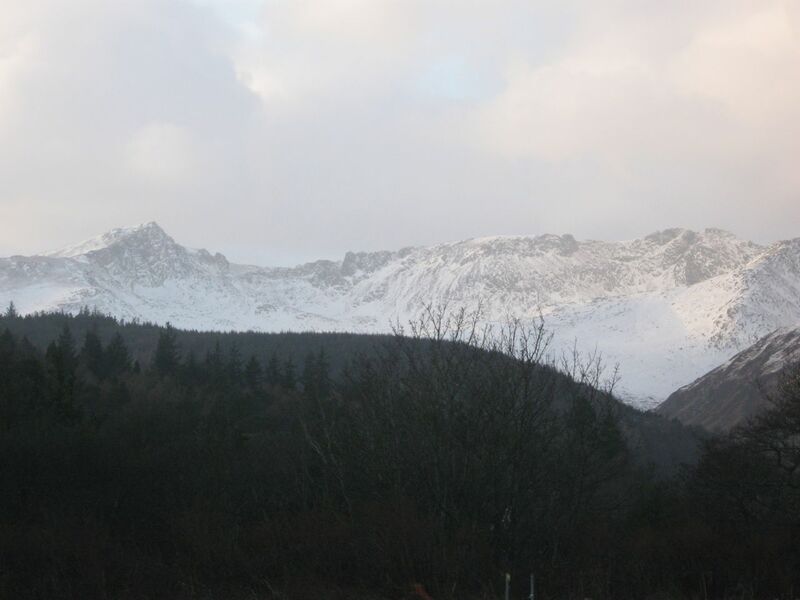 As it’s Easter weekend this week, Arran usually experiences a significant rise in the number of holiday home owners and holiday makers and although the major hotels are open, anyone planning to come to Arran is asked to check with their accommodation provider to make sure that it is suitable still to come over. Let’s hope for everyone’s sake the situation levels out sooner rather than later. TWO AND A HALF DAYS WITHOUT POWER – AND WE’RE THE LUCKY ONES! My neighbour’s son lives in Ulan Bator in Outer Mongolia and my son, as you probably know by now from the blog, lives in Peru. 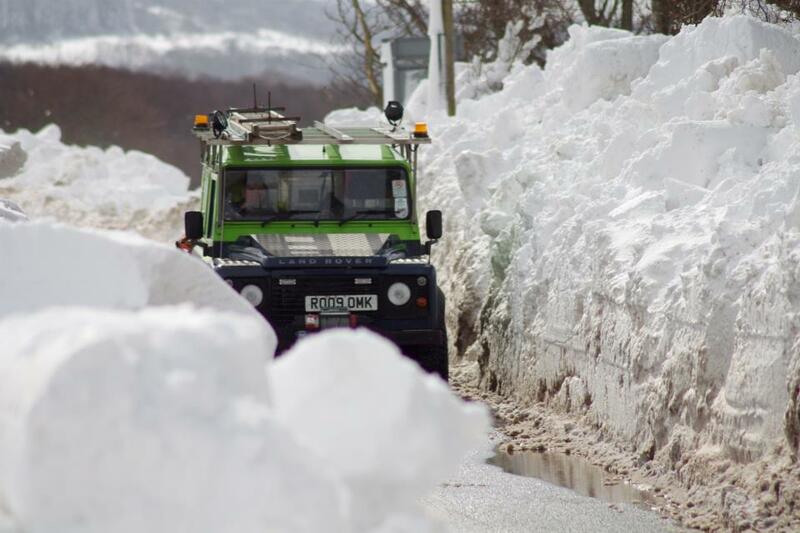 One way or another they both knew that Arran was completely snowed in, cut off and shut down from Friday morning to Sunday lunch time. We have been on the national news – which we unfortunately couldn’t watch and without phone and computer off island communication was at a definite minimum. Tonight I’m warm, well-fed and basking in the arrival of number one son from Philadelphia, who as I write has just given in to jet lag. As when he was two years old, the sight of him asleep on the sofa softens my heart and I look forward to more craic (translation: chat) as he gradually wakes up. I’m also thinking about the people on the other side of the island who are still cut off literally and figuratively and hope that all will be back to normal soon. Whatever that will be. I promised you a tale of how I became a weaver and why we came to Arran. At the moment that seems unreal in light of the past week’s events, so I’ve decided to put it into bullet point form, so that I’m ready with my next blog to write about current events which seem to be overtaking past memories at the moment. I walked out of his office, gave a month’s notice on my apartment, wrote to the Tourist Board on Arran to find a cottage, which I did, and got a quote from Thomas Cook to ship my loom over to Arran, thinking that I would give it three months to decide whether it was going to be viable to work as a craft producer, packed up all my belongings and came to Arran on Bonfire Night 1975. I’m still here. I may have had unexpected and difficult times, but never ANY regrets and now looking back even from this forbidden wintry environment, I would not have had it any other way. From now on I’m going to focus on the serendipity of our life on the island rather than the chronology. I hope it will make sense and you will begin to see the new Spiderweb form as the story unfolds. In the first few months life in Stockholm settled into a routine. I attended Swedish classes in the mornings at the University, my daughter thriving in the very progressive day care there. Afternoons were spent being a Mom, walking round Stockholm with the pushchair getting to know the city, making friends and spending time with Astrid, learning more about weaving and Swedish cookery. No time to focus on weaving just yet. I passed the Swedish exams and got admitted to Stockholm University. Because my main subjects had been German and Spanish before, it was impossible to continue to study them because I couldn’t manage from a Swedish perspective, so I decided to study Linguistics. Most of the texts were in English and I was allowed to take my exams in English too, so I finished the first term and was allowed to continue the work for my MA degree. Two things were happening in the background, though, which were to have lasting consequences. First of all we had to leave our rental apartment, which was OK because by then I qualified for student housing, so we were given a lovely family apartment set in royal parkland which was a grant from the king. The complex was very modern and convenient and most of all safe for children as there was play space in each square of houses and usually someone on hand to share childcare. Having a secure place to live because I was a student gave me the courage to face another situation which I had been sweeping under the carpet. My marriage had been slowly disintegrating and after a year in Sweden we agreed to separate. This led to an amazing amount of emotional upheaval for me while I tried to juggle the Mom, student, and woman roles. It took me many years to recognise the deep grief that I carried with me for the loss of something I had valued so highly and never really understood why it had been lost. I decided to stay in Stockholm and continue with my studies since I’d worked so hard to get into University and I was enjoying my course. My daughter had state-of-the-art preschool care and was becoming bilingual. Ironically the day my husband moved out, I received my work & residency permit to enable me to stay in Sweden and take a part-time job. Weaving was definitely on hold, though, while all of this was sorting itself out. I had signed up for a summer course at the weaving school in Stockholm now called HV where traditional techniques were taught in a lovely old building which had been there since the 1700’s. The waiting list was long and it took me a year and a half to get a place. Meanwhile I bought a loom (which is a story in itself) and continued to learn the basics as a hobby. Everything else in my life pointed to me becoming a linguist. I completed my course and wrote my thesis on the brain development of bilingual children, using 3 year olds in the complex where we lived as research subjects. I was gaining a reputation as an expert in the field and began to give lectures to teachers and other educational groups – in English because the stress of talking in public froze the part of my brain that was becoming fairly proficient in Swedish. I worked for the next few years finishing my degree, teaching English and becoming an independent Scandinavian woman. But I was restless and certainly not content. The summer of 1973 I got a place on the weaving course I’d been waiting for. The minute I walked into that classroom full of looms and yarns in all colours of the rainbow, I knew I’d found myself. 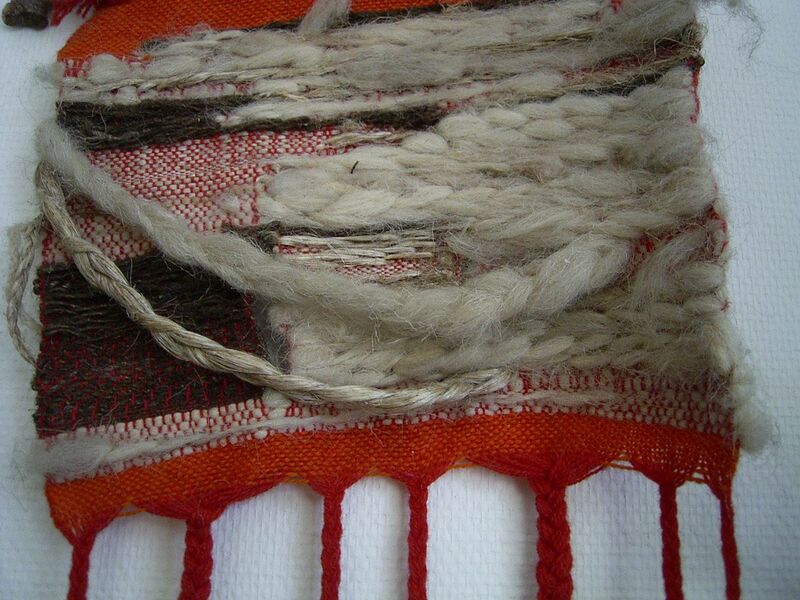 It took me another two years to fulfill my other obligations and to be able to think about weaving full time. And that’s the next part of my story.